What does the tile in your bathroom say about you? There is no place in your home where the appearance of cleanliness, or the lack thereof, has more impact than in the bathroom! No matter how beautiful your bathroom tile is, if it is surrounded by dirty, stained grout it is going to raise troubling questions in the minds of those that see it. Everyone knows that grout, due to it’s porous texture, has a tendency to absorb anything that is spilled on it. 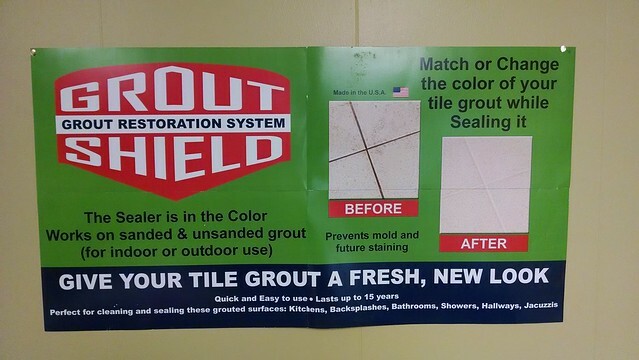 Grout Shields Color Seal returns grout to “like new” condition and establishes a barrier protecting it from stains and dirt in the future! Grout Shield products are affordable, easy to use, and come in a wide variety of colors. Not only can you browse the GroutShield Color chart, but, we are also able to blend custom colors from most major brands of residential paint color charts as well. While paint is significantly different from grout sealer in chemical composition, it responds quite similarly to the pigments that give paint it’s coloration. The fresh look of sealed colorized grout will establish your bathroom area as the standard to which all who see it will try to keep up with. When people realize how their tile and grout look, as compared to those treated with Grout Shield products, they will never view their own floors, and tiled surfaces, in quite the same way again. From the time you notice you have dirty grout … every time you look at your floor … dirty grout is all you wil see!